This invaluable resource is ideal for those seeking essential church history information in a hurry. These timelines offer a clear, comprehensive and intriguing summary of theological issues, texts, people and cultural topics that are significant in the growth of the Western Church. 299 pages, from Zondervan. 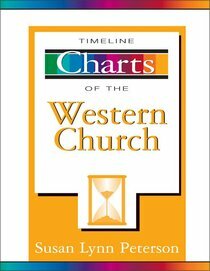 About "Timeline Charts of the Western Church (Zondervan Charts Series)"
This collection of charts and timelines is an invaluable resource for studying the history of the Western Church, providing information on Theological Issues, People and Events, the Wider Culture, and Theological Texts in a time-tested and highly accessible form for students and lay readers interested in church history. What do the history of the Quaker church and the women's suffrage movement have in common? How did Luther's 95 Theses fit into the wider context of the world in that day? Turn to Timeline Charts of the Western Church to find out! Timeline Charts of the Western Church is the first comprehensive presentation of the history of the Western Church in a proven and clear timetable format. In three sections, it supplies both summarized and detailed information that students, professors, professionals, and lay persons alike will find valuable and accessible. The main part of the book, modeled after Bernard Grun's Timetables of History, organizes in-depth information into four categories: - A. Theological questions/Issues - B. People/Events - C. Wider Culture - D. Texts -- A detailed index supplies enough information to provide a stand-alone resource. Three appendices offer brief overviews that allow the reader to quickly grasp the essentials of different eras in Western Church history.